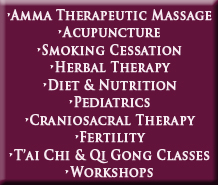 Kim Rosado holds a Bachelors Degree in Asian Bodywork and a Masters Degree in Acupuncture. She is a Diplomate in Asian Bodywork Therapy (NCCAOM) and a Certified Instructor of the American Organization of Bodywork Therapies of Asia (AOBTA). She was Chair of Physical Arts at the New York College for Wholistic Health Education and Research, Clinic Director of the Advanced Amma Therapy clinic and senior faculty, teaching Basic and Advanced Amma Therapeutic Massage, Eastern Nutrition, Oriental Medicine, Point locations and Clinical Applications of Wholistic Medicine. Kim has also participated in acupuncture research at Columbia University and currently assists in clinical instruction of Integrative Therapies III in the School of Nursing. Kim is a Third Degree Black belt Instructor of Shorin-Ryu karate and demonstrated at the World Shorin-Ryu Karate Demonstration in Okinawa in 1991. She also holds a black belt in Shotokan Karate, a Black Sash in Xing Yi and Ba Ji, has been teaching Tai Chi Chuan for over fifteen years and is an instructor of Qi Gong. In addition, Kim is also a practitioner of Cranial-Sacral Therapy and Hypnotherapy. She is currently in private practice with Faye Schenkman and the Schnoodles in Huntington, New York. Faye and Kim conduct workshops in Amma, Wholistic Nutrition, Herbalism and Qi Gong throughout the United States.